It probably never would have happened had it not been for the fact that we were trapped in Studio 8H for camera blocking for hours on end which was business as usual. A group of us were sitting around the Green Room, which was next to Lorne’s office on the 9th floor overlooking the studio stage. This was where we took our meals between the dress rehearsal and the live show. It was also where we got notes and the chopping block for sketches. But you’d never know that kind of carnage took place at any other time in this unassuming spot. It was furnished with the kind of couches and chairs that said ‘we don’t give a crap about this late night summer replacement show, let’s give them the stuff we have in storage’. The color palate was ‘tan 70s vomit’. In the room were Gilda Radner, Paul Schaffer, Cathy Vasapoli (Paul’s girlfriend, now, his wife) Marilyn Miller, Alan Zweibel, Al Franken, and me. We were all in varying stages of exhaustion (the writers, obviously, even more so) and were draped over the furniture like the kids in the “Going Steady” number from Bye Bye Birdie. “Hey, isn’t it pasacccchhhhhhhhhh?” Zweibel asked, shredding his throat and getting the laugh his sacrifice deserved. “Why, yes it is Alan” Paul Schaffer said with his inscrutable Cheshire Cat demeanor. There was silence in the room while all of us pondered this. At least I think that’s what everyone was doing. That’s what I was doing. It dawned on me that this was my first Passover away from home. There was actually no one around to compel me to celebrate it. 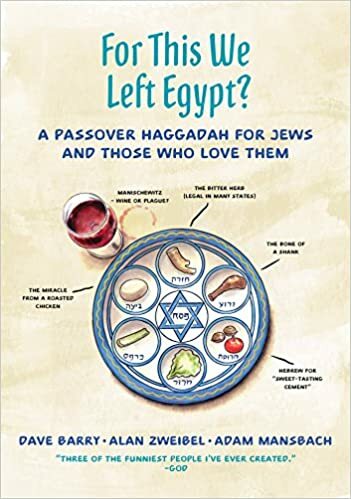 My relationship with Passover was so traumatized by the ritualized starvation perpetrated by the four-hour ceremony at my Uncle Ed’s, that I never even understood what the dang thing was about. I was snapped back from my reverie by Al Franken’s familiar honking laugh. “Where would we get the food, Pastrami ‘n’ Things? Everyone howled. The ubiquitous deli in the lobby of 30 Rock was the only game in town (they delivered fast!) and we grew to love it in a Stockholm syndrome kinda way. Their French fries were long, large grease sticks….in other words; delicious. Marilyn Miller’s cackle and Gilda’s sharp inhale followed by silent shaking joined Al’s honk as we tried to figure out how to link deli food to the Exodus from slavery in Egypt. By this time, Pastrami ‘n’ Things was used to the kids on the 17th floor. Used to Gilda’s “Harry Met Sally” style of ordering and the constant changes and additions that went on, nonstop, from late morning, until closing time. After we’d ordered, we went across the hall to a conference room that had three long tables suitable for serving the now increasing crowd of people. Paul Schaffer was our ‘abba’ (father) and it was right. What I wasn’t prepared for was how well he knew his stuff. It just seemed so antithetical to his hip ness. Some of the swingin’ cats from the Saturday Night Live Band wandered in and I was flabbergasted when Alan “Mr. Fabulous” Rubin (our trumpet player) recited Hebrew without missing a step. All were welcome, and when it was time, Paul said “And now, to recite the four questions, I’d like to ask my beautiful shiksa girlfriend Cathy”. We all looked at Cathy and cheered her on as she blushed demurely. Billy Murray (the new kid) had wandered in, but it was his lounge lizard character ‘Nick’ who led us in his own versions of “Dayenu” and “Let My People Go”. The improvised, or what I like to think of as ‘improved’ lyrics, were priceless. What I can remember, I don’t dare repeat. Holding a fry aloft and waving it Paul said; “I will now ask you to dip your French fry in the Ketchup twice to signify the suffering of our people.” The last part; ‘our people’ was sung in the Rabbinical style of vocal davening. The prize for finding the Afikomen was the chance to ‘warm up’ the audience. Franken and Davis won. That was divine intervention, big time. Wine, a sacred part of the ritual, was punctuating everything we could think of in our jerry-rigged ceremony. Wine and some, uh, not so bitter herbs. Gilda and I had just seen the movie version of Hair, and after a few cups of wine, we thought it would be a sensational idea to sing the title song while dancing, arm in arm, on top of the tables. The next day, Gilda and I wondered if we’d been as entertaining as we thought, but one thing was certain; all theatre companies become families and we’d just had our first family holiday together. Slap dash as it was, it was a Seder unlike any other I’ve experienced before or since.